Step into the revolution that changed the world You don't need to know anything about the French Revolution to enjoy Path of the Patriots, because this historical time-trip tells you everything! You'll see squatters in the Louvre, revolutionary committees in royal bedrooms, savage massacres and beheadings where Parisians now sit eating their sandwiches, and a revolutionary prison right in the middle of Boulevard Saint-Germain. Path of the Patriots is a goldmine of tales and anecdotes about this turbulent period in Paris's history, and it tells you where to eat and drink while reading them. This book is so full of fascinating stories, you'll enjoy it just as much sitting at home with a glass of wine as you will when you're wandering around the beautiful French capital. You'll never look at Paris in the same way again! Path of the Patriots comes in two volumes, and has a total of ten walks. 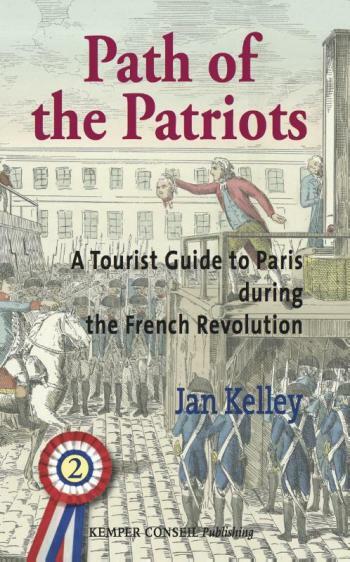 The first four walks are in Volume One, which also gives you an introduction to the Revolution through a brief history of what happened, biographies of the people who made it happen, and a description of what the city of Paris looked like during the revolutionary era. In Volume Two there are six more walks that will complete this unique experience of Paris during one of its most dramatic periods of history. Whichever of these two volumes you read, get ready to step into the Revolution that changed the world! About the Author Jan Kelley is from London, but has spent much of her adult life in other places, including New York, Boston and Paris. Her professional life has been equally varied, ranging from teacher to translator and writer. A life-long love of history coupled with living in the ancient heart of Paris led her to write this book. --------------- Take a historical time trip through the streets where it all happened, to where Parisians lived, worked, ate and drank, rose up in arms, and to where many ended their lives under the blade of the guillotine. The two books contain ten walks, which take the reader around different neighbourhoods that were instrumental in the Revolution. Each walk gives the visitor a complete experience of the atmosphere of that area during this period by pointing out the people and revolutionary events associated with it. Also included are references to contemporary architecture, and some of the more colourful residents, as well as restaurants, brasseries and cafs with a revolutionary history. Each walk is full of stories and anecdotes, as well as illustrations, maps and detailed instructions. They reveal hidden treasures that will never be found in a typical tourist guide of Paris. Path of the Patriots is not just about the unknown. It also takes you to many of the more famous sights of Paris, including the Louvre, the Tuileries, the Conciergerie, Notre-Dame, Place de la Concorde, the Pantheon, the Palais-Royal, as well as a complete walk through the town and chteau of Versailles. Now, however, you have a different view. The Pyramid is not just the new and elegant entrance to the Louvre. It stands on the site of a labyrinth of tiny streets where rebellious citizens rose up against the King, and where the Queen got hopelessly lost while attempting to escape. Every walk offers a different glimpse into the excitement, idealism, and terror that characterized this amazing period of history, be it following the path of the condemned to the guillotine along the rue Saint-Honor with stores and cafs still standing today, or visiting the prison that held Josephine during the Terror and still has her graffiti on the walls. The storming of the Bastille comes to life before your eyes as you have a drink on a caf terrace that now occupies the main courtyard of this famous prison. For frequent visitors to Paris, this guide offers a unique way to look at the city. It gives an extra dimension to popular sites like the Tuileries by showing what used to be there (i.e. the Tuileries Palace, demolished in 1884) and what happened there. Many do not know that this is where Louis XVI and Marie-Antoinette were first held in captivity, and where Robespierre compiled his dreaded list of suspects. Even fewer know that Thomas Jefferson attended musical concerts there, and only just escaped from being the first victim of the Revolution. The Walks 5 From the Temple of Reason to the Temple Prison Here you will discover the fascinating Enclos du Temple, the 'town within a town' that was a refuge from the law and a tax haven for thousands of people. It is better known, though, as the prison where Louis XVI and Marie-Antoinette lived their last few months of family life. Between the site of this infamous royal prison and the great cathedral of Notre Dame, you will follow the young Danton as he tries to find his way around Paris for the first time. During this walk, which takes you through the Marais, you meet that singular 18th-century character, Caron de Beaumarchais, and see the house where he wrote 'The Marriage of Figaro' and organized aid to the American rebels. You will also re-live the last violent moments of Robespierre's power, and be a witness to one of the darkest events of the Revolution, the murder of Marie-Antoinette's devoted friend, the Princesse de Lamballe. 6 Ghosts in the Place du Carrousel This walk takes you back to the golden days of the Tuileries Palace, home to royalty before becoming a royal prison, and then the seat of the all-powerful Committee of Public Safety. During the revolutionary period the area between the Tuileries Palace and the Louvre was a maze of dark, narrow passages, where the houses of common folk stood side by side with bourgeois mansions. It was through this labyrinth of streets that Robespierre's 'fiance' hurried to her art classes, where great masters were sold at bargain prices, where Napolon was nearly assassinated, and where Marie-Antoinette wandered, completely lost, right under the nose of her unsuspecting subjects. When the monarchy was finally toppled, these same subjects, now enraged, poured out of their homes to join the crowd that was heading menacingly across the Place du Carrousel towards the Tuileries Palace. 7 The Route of the Condemned I From the Conciergerie prison sad processions of tumbrils set off each afternoon, transporting the daily batches of victims destined for the guillotine in Place de la Concorde, known then as Place de la Rvolution. In walks number seven and eight you will follow in their footsteps, from prison cell to scaffold to grave, at the same time getting to know some of the residents of the area and the events that took place there. During walk seven you visit their prison, see where they were judged by the famous Revolutionary Tribunal, and then follow them as they are jolted around in a tumbril during their long and uncomfortable journey to the scaffold. On the way you'll see where Danton met his first wife, visit the pharmacy where a romantic Swedish count bought ink to write letters to the Queen, and witness the funeral cortege of a slightly less romantic but more famous count. 8 The Route of the Condemned II Walk eight re-joins the tumbrils as they roll through the Place du Palais-Royal on their long journey to the scaffold, and along the way you'll see a church where General Bonaparte emerged from the unknown to become a glorious hero. You'll visit the magnificent house where Lafayette spent the first years of his marriage, and in Place Vendme you can see where Danton ran the Justice Ministry, as well as a house that contained a lot of mesmerised Parisians. This walk takes you through Robespierre's neighbourhood to the site of the famous Jacobin Club, where he reigned supreme during the Terror, and if you want to get better acquainted with this redoubtable revolutionary, you can have lunch or dinner in the same place where he ate every evening with his adopted family. After witnessing the last moments of the most famous patriots in the Place de la Rvolution, and then following them to their burial place, you will end your walk at a highly subversive dinner party. 9 Sans-Culottes, the Terror, and a Path of False Hope For four centuries the inhabitants of the faubourg Saint-Antoine lived in the shadow of the grim mediaeval fortress known as the Bastille. For them it was an ever-present symbol of royal despotism, so it isn't surprising they chose it as a target on July 14th 1789, a day in French history that has never been forgotten. As you visit the faubourg Saint-Antoine - which unfortunately has been forgotten by many of today's visitors to Paris - you will be walking with the ghosts of hundreds of unsung popular heroes, for this was the cradle of the sans-culotte Revolution. The sans-culottes of Paris played a vital part in pushing the Revolution towards many of its most radical social reforms. But it was a violent process, culminating in a Reign of Terror that saw hundreds of hard-working citizens denounced, often by neighbours or even their own family. People lived in fear of the guillotine, and would do anything - and pay anything - to avoid being sent before the Tribunal, which meant almost certain death. Some did this by becoming 'patients' at Doctor Belhomme's clinic, where money bought safety. But for how long? 10 Power and Glory This walk begins in the faubourg Saint-Germain, seat of the rich and powerful for nearly three centuries, and home to the Empress Josphine when she was still known as Rose. By 1792 most of its residents had emigrated, and the Revolution moved in, taking over great houses like the Htel de Salm, occupied by a political club, and the Palais Bourbon, which became the seat of the Directory government. Here were the roots of today's 7th arrondissement, still a bastion of the republican establishment and home to numerous government ministries. The walk ends on the Champ-de-Mars, where you'll re-live the best and worst of the revolutionary era.